Crisp parmesan biscuits topped with a rich mushroom duxelle and a herb salad. Cut the butter into small dice and rub together with the flour to form fine breadcrumbs. Add the parmesan and the egg yolks and bring the mixture together into a ball. Place the dough between two sheets of baking parchment and roll to a thickness of 2mm. Chill in the fridge for at least 20 minutes. Once the pastry is well chilled, remove from the fridge and transfer straight to the oven. Bake for 20 minutes or until golden brown in colour. Remove from the oven and use a pastry cutter to cut round discs which will form the base of your tartlet. Allow to cool. Peel and finely dice the shallots. Thinly slice the mushrooms. Heat a frying pan and add a drizzle of olive oil. Add the shallots, bouquet garni and salt to the pan and cook for 3 minutes. Add the mushrooms and cook until soft and starting to stick to bottom of the pan. Remove the bouquet garni and then blend the mixture to a coarse puree. Allow to cool. Pick all of the herbs. Clean the mushrooms and cut into half centimetre matchsticks. Dress the herbs with half of the olive oil and half of the fleur de sel. Dress the mushroom batons with the rest. To serve: place the parmesan biscuit in the centre of each plate. 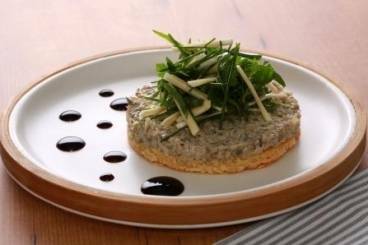 Use a serving ring that is slightly smaller than the tart base, neatly spoon the mushroom duxelle on top. Top with a handful of herb salad and arrange the mushroom batons on top.